It has long been recognized that CO2-rich fluid inclusions decrepitate at quite low temperatures, typically less than 300 C and sometimes as low as 100 C, giving distinct peaks on the acoustic decrepigram results. This relationship was first documented by Burlinson in 1984 : [abstract as a pdf file] and confirmed by Mavrogenes et al (1995), who did careful optical abundance measurements of inclusions and quadrupole mass spectrometric analysis of gases released from fluid inclusions. 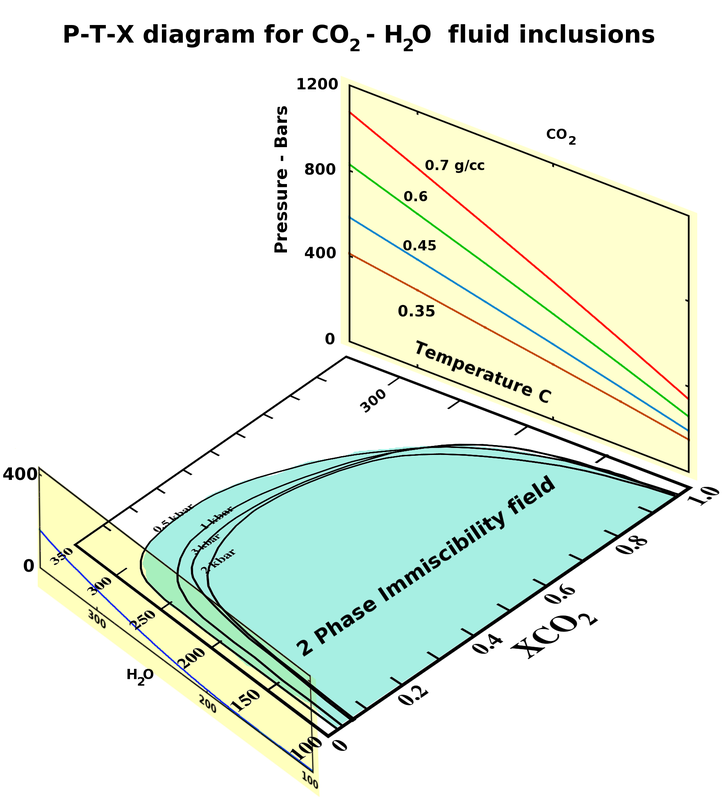 Microscopic homogenisation studies also frequently mention that they could not obtain a homogenisation temperature for CO2-rich inclusions as they decrepitated before they homogenised. When such decrepitation temperatures are reported they are in the range of 150 to 300 C, in agreement with the peaks noticed in acoustic decrepitation data. To date there has been no clear explanation of why CO2-rich fluid inclusions decrepitate prematurely at low temperatures. However this premature decrepitation is a consequence of the lack of condensation of CO2 to a liquid phase at usual geological PT conditions. Consider a pair of inclusions formed in quartz at about 380 C and 1 Kbar pressure. (Shown as the formation point in the following PT graph). One inclusion is comprised of water (of low salinity) with no CO2 and the other inclusion is of CO2 with no water. At these conditions the aqueous inclusion is a liquid and the CO2 inclusion is a gas, highly compressed and of high density. 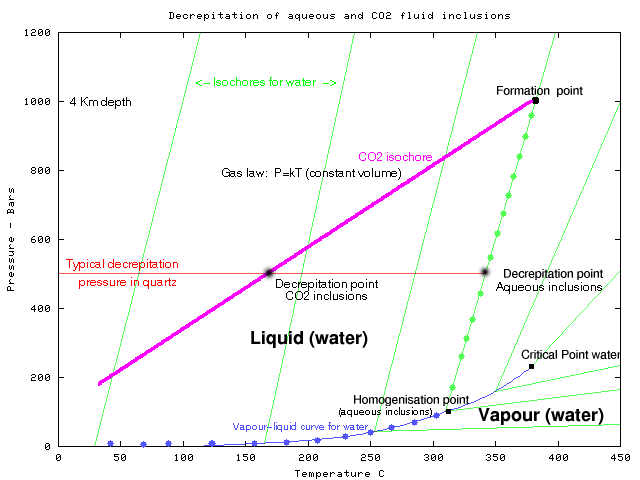 As the aqueous inclusion cools, it follows the green isochore (an isochore is a line of constant density on a PT diagram) down to the vapour liquid curve at the homogenisation point. It then nucleates a vapour bubble and on further cooling it follows the blue vapour liquid curve back to room temperature and pressure, the volume of the vapour phase increasing and the liquid phase contracting as the inclusion cools. At room temperature the internal pressure of the aqueous inclusion is near zero bars. During cooling from their formation conditions, there is a confining pressure on the quartz host mineral similar to the internal pressure of the inclusions, so the inclusions will not burst. But when observed and heated in the laboratory, the confining pressure on the quartz host mineral is only 1 bar. During heating the inclusion conditions follow the same pathway as when they cooled and soon develop internal pressures sufficient to break the quartz now that it has only 1 bar of confining pressure. A very approximate estimate of the overpressure needed to break the quartz is shown by the red decrepitation pressure line at 500 bars. In the above graph, the aqueous inclusion will generate little internal pressure during heating as it progresses up the vapour-liquid equilibrium curve to the homogenisation point at 320 C. At this temperature the liquid has expanded to fill the inclusion and there is no longer a vapour bubble. Upon further heating the inclusion pressure progresses up the green isochore. The liquid rapidly develops a high internal pressure as it tries to expand within the fixed volume of the inclusion and by 340 C has developed enough pressure to burst the quartz host grain. The observed decrepitation temperature of 340 C is acceptably close to the original formation temperature of 380 C, and acoustic decrepitation observations can be used as a reasonable indicator of the formation temperature. For the CO2 inclusion, the pressure immediately starts to increase as it is heated, progressing along the PT line shown in magenta and by 170 C, in this case, the internal pressure is sufficient to burst the host quartz grain. The observed decrepitation temperature of 170 C is a poor indicator of the formation temperature of 380 C. However, the very low temperature decrepitation is characteristic of the presence of CO2 rich fluid inclusions and is easily measured using the acoustic decrepitation technique. 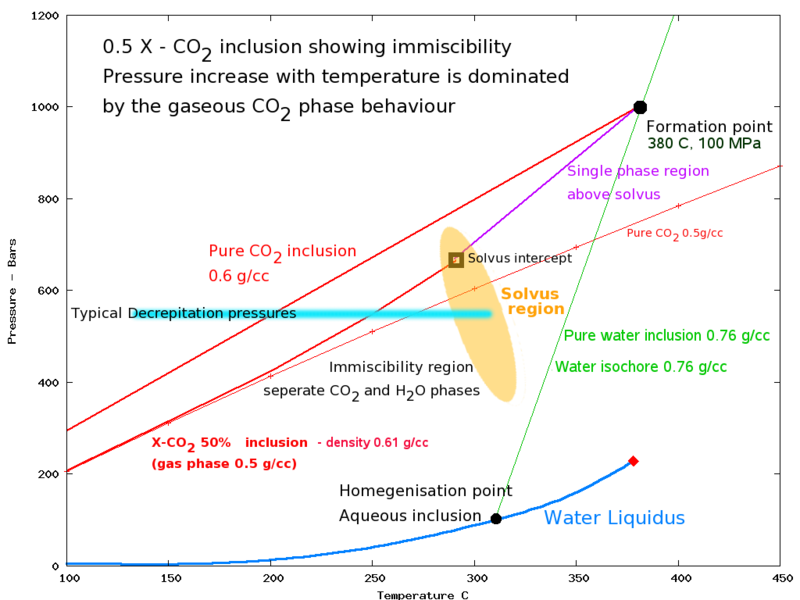 The above diagram is only approximate, but at the formation point, the density of a pure water phase is 0.7 g/cc while a pure CO2 phase at this point would be about 0.6 g/cc and a pure methane phase at this point would be about 0.22 g/cc. Mixtures of CO2 and water within an inclusion will give results intermediate between these 2 end-point cases. Precise calculations based on the mole fraction of CO2 present will depend also on the solubility of CO2 in the aqueous phase, and this in turn will depend upon the salinity of the aqueous phase. However it is clear that as CO2 is added to an aqueous system the decrepitation temperature will be lowered, and perhaps substantially so. It is this lowering of the decrepitation temperature with the increase of CO2 in the system that is easily measured by the acoustic decrepitation method making it a useful exploration tool in finding interesting hydrothermal systems with significant CO2 -rich fluids. Such CO2 -rich fluid systems are frequently associated with gold mineralisation as documented by Burlinson (1991), :[Burlinson full paper as a pdf] Mavrogenes et. al. and Partamies & Poutiainen (2001). 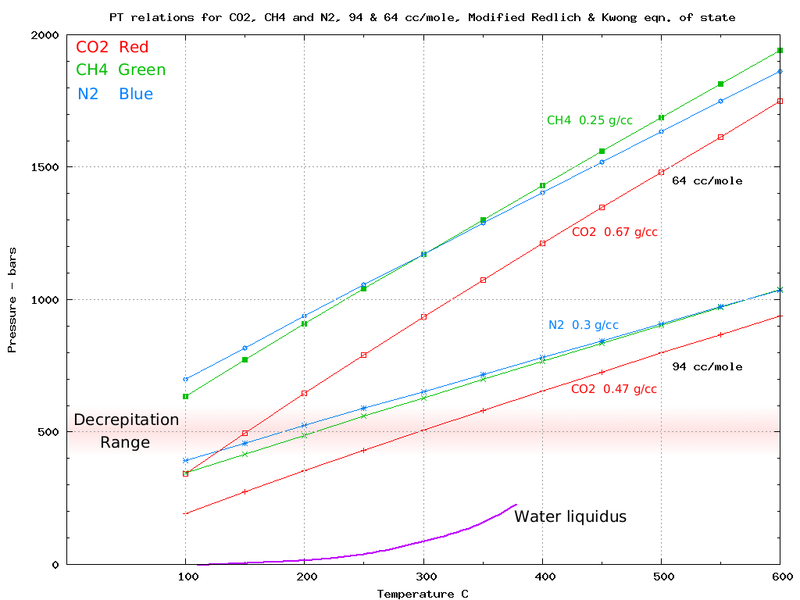 The figures here shows that an aqueous - CO2 fluid inclusion mixture will behave predominantly like a CO2 rich inclusion. Pure CO2 fluids are uncommon and most inclusions contain CO2 and water and perhaps some NaCl . Methane and nitrogen are less common additional constituents. The addition of non-condensible gases such as methane and nitrogen does not change the decrepitation behaviour, as these gases also follow the gas law equation during heating and cooling. Different chemical species of gases do not have different P-T expansion properties. The addition of solutes to the aqueous phase tends to suppress the solubility of CO2 and so increase its pressure in the gas phase, causing slightly more lowering of the decrepitation temperatures. Real fluid inclusions vary greatly in their size and morphology. This has a major effect on the decrepitation behaviour as large or angular inclusions can more easily break the host quartz grain. While aqueous inclusions are often 5 to 20 microns across and somewhat rounded, it is common for CO2 -rich inclusions to be quite large (50 or more microns) and extremely irregular with sharp points. The stress concentration at these points on the inclusions makes it much easier to break the host quartz grain. This accentuates the lowering of decrepitation temperature by CO2 -rich fluids as they may be able to decrepitate at, say, 300 bars overpressure instead of 500 bars. If the inclusions are formed at low pressure (epithermal environments), they may not decrepitate at all. In the above scenario, an aqueous inclusion formed at 400 bars would need to be heated a little past its formation temperature before it develops enough internal pressure to burst. However, a CO2 inclusion formed at 400 bars may never develop enough internal pressure to burst at all. And low density water inclusions ("steam") may homogenize to a vapour phase instead of a liquid and these would never develop enough internal pressure to decrepitate. This agrees with decrepitation measurements on high level systems in which it has been found that decrepitation is rare or absent. This figure shows that the behaviour of various gases are all very similar as they all approximately follow the ideal gas law, as explained here. Inclusions containing methane or nitrogen instead of CO2 will behave just like CO2 inclusions, so long as they formed at high pressure. All gases follow approximately the same PT expansion path as CO2 . There may however be some mitigation of the decrepitation if inclusions of these other gases are morphologically different to CO2 inclusions. From the above discussion, acoustic decrepitation should be applied with caution to high level epithermal systems and "steaming haloes" in which the formation pressures are very low or the depositional fluid was water vapour rather than liquid water. Deposits formed under boiling conditions would probably only show decrepitation from the liquid phase of the system and not from the vapour/gas phase unless it boiled at very high pressures. There have been claims that methane rich inclusions do not give an acoustic decrepitation response. Such claims are misleading. Typically the formation pressure or density or detailed fluid description of these inclusions is unstated so it is impossible to resolve the controversy. But in some cases (e.g. the Tanami goldfields, NT, Australia) an author has claimed to have found "methane-rich" inclusions formed at high pressures and no low-temperature acoustic decrepitation was observed. Although I do not have access to formation pressure information on those samples, the whole province is claimed by the same authors to have formed at considerable depth - at least meso-thermal. A few samples from the Western Australian Archaean lode gold deposits with claimed methane rich inclusions also failed to decrepitate below 300 C.
The theory cannot be reconciled with these claimed observations. The cause of this apparent contradiction is incorrect description of the fluid inclusions during microscopy. (Confirmed by discussions with the authours of the Tanami data above.) Although the Tanami region inclusions are described as "methane rich", they are actually water rich, with a methane rich vapour phase. However, the vapour phase is volumetrically small and the molar proportion of methane in the inclusion as a whole is miniscule. It is grossly incorrect to call such inclusions "methane rich", they are in fact ordinary aqueous inclusions, with traces of methane present. Hence their overall decrepitation behavior is that of an aqueous inclusion and they will not exhibit any anomolous low-temperature decrepitation. Other possible causes include the use of leaked or decrepitated inclusions in the microscopic work, or reaction between CO2 and methane to give graphite and water post-entrapment. Methane cannot behave significantly differently to CO2 - they both obey the gas law! Acoustic decrepitation is an easy and rapid way to determine the presence of CO2 -rich fluid inclusions in mesothermal environments. The actual decrepitation temperature measured gives a vague idea of the mole fraction of CO2 present - though there are several complicating factors. For aqueous inclusions, the decrepitation temperatures can be used as an approximate indicator of the formation temperatures. This is a far easier and faster way of determining formation temperatures on samples than is microthermometry, which can then be used sparsely as a control on the decrepitation data rather than as a primary measurement method. The decrepitation data can also be used as a "reality check" on microscopic observations. In particular it is apparent there are some problems with some of the data on methane rich inclusions reported in the literature. Cases have also been seen where microthermometry was inadvertently performed on secondary inclusions and this error was quickly isolated using the decrepitation results.